The latest addition to the American Audio range is their Radius 1000, an exciting new CD/MP3 player with MIDI capabilities for controlling professional music playback software. The Radius 1000 is a hands-on device that lets you play digital tracks directly from your computer without using a mouse, just like you would with a professional CD deck, giving you a real hardware feel. 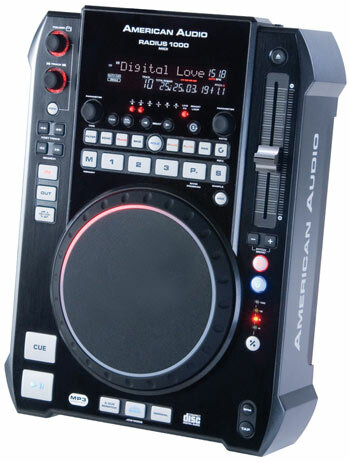 In addition to functioning as an 8-channel MIDI controller for music playback software, the Radius 1000 also plays CD, CD-R and MP3 discs, giving users the flexibility of DJ-ing with discs or a computer. In fact, there’s even a Dual Mode that allows users to play a CD or MP3 disc and control their computer software at the same time! With its dual functionality, the unit provides its own backup system: in the event of a computer crash during a gig, DJs can simply switch over to playing discs on the Radius 1000, just like a regular CD/MP3 player. The Radius 1000 offers a range of premium features, including Seamless Loop, Advanced Track Search, 10-Second Anti-Shock Memory, Fader Q Start, 3 Flash Start Buttons, Digital Output (S/PDIF), Tempo Lock and Instant Start. For DJs who employ larger, more sophisticated audio setups, a Flip Flop function allows relay playback between two Radius 1000 CD/MP3 players. The deck comes with 9 onboard digital effects: Scratch (Digital Scratch and Beat Juggle modes), Filter, Echo, Trans, Skid, Phase, Flanger, Pan and Bop. Time & Ratio Adjustment is available for all effects and a Digital BPM Counter keeps them locked in sync with the beat of the music. The Radius 1000 features an intuitive design that not only boosts functionality but also looks great as a part of a DJ’s rig. A bright display shows track and artist ID tags for quick reference, and a red LED visual marker rotates around the jog wheel to show what point within the track is currently playing. Compact and lightweight for easy mobility, the Radius 1000 measures 265 x 356 x 106mm and weighs 3.6Kgs. With a suggested retail price of £339.00, it offers great value for any professional DJ who wants a hands-on control interface for their digital DJing setup while retaining the ability to play regular CDs.